POP displays are a bit like the fashion industry: They must continually evolve to meet the changing needs of retailers and brands. In many of our blogs we try to share examples of our display work across a broad range of industries, products, display types and categories. 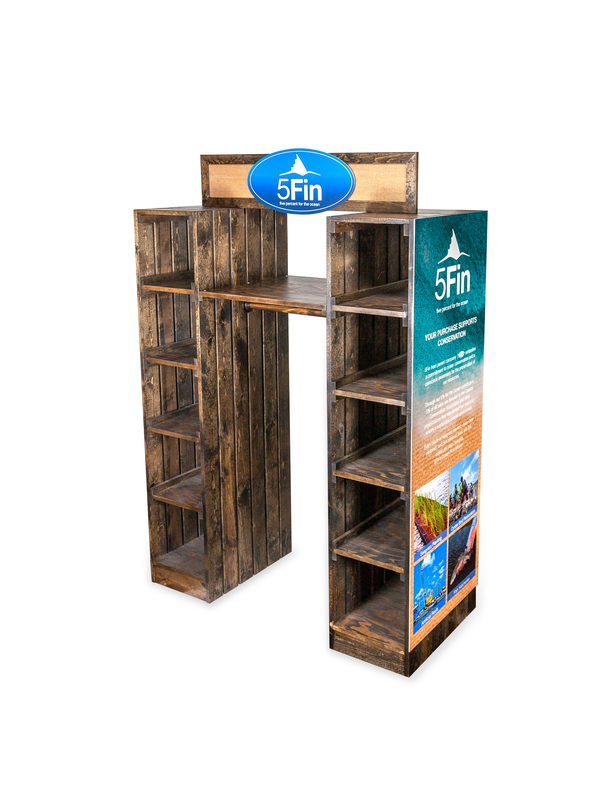 While much of the work we do involves custom retail displays, we also try to share examples of some of the stock displays we offer that are ready to ship right away. We work with many of our customers to customize our stock displays by adding custom signs and various accessories. or you can download it from our website at www.richltd.com. 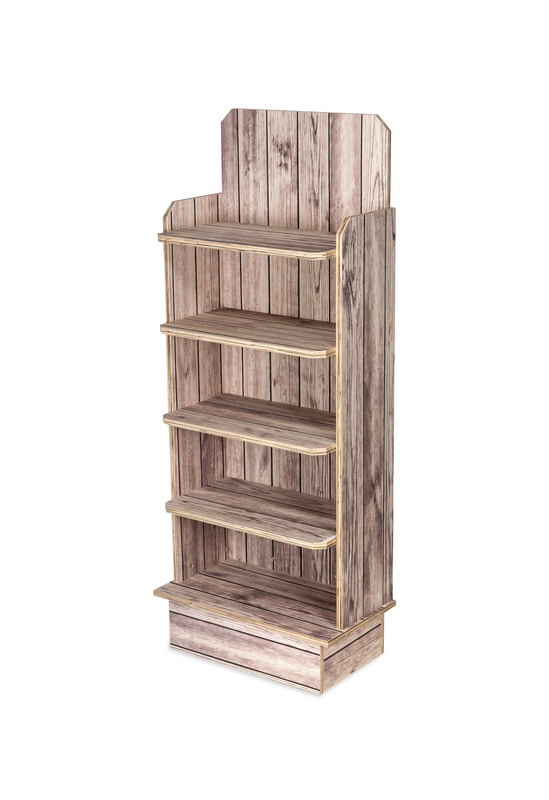 In this year’s catalog, you will see many examples of custom displays which we hope will provide you with design inspiration for your current and upcoming display projects. To give a couple of examples of what you’ll see in the custom section of the catalog, here are two units we made in our Oceanside, CA millwork shop. The first is a stained solid wood T-shirt cubby display featuring 10 cubbies, a center shelf, apparel hang bar, and side/header signs. 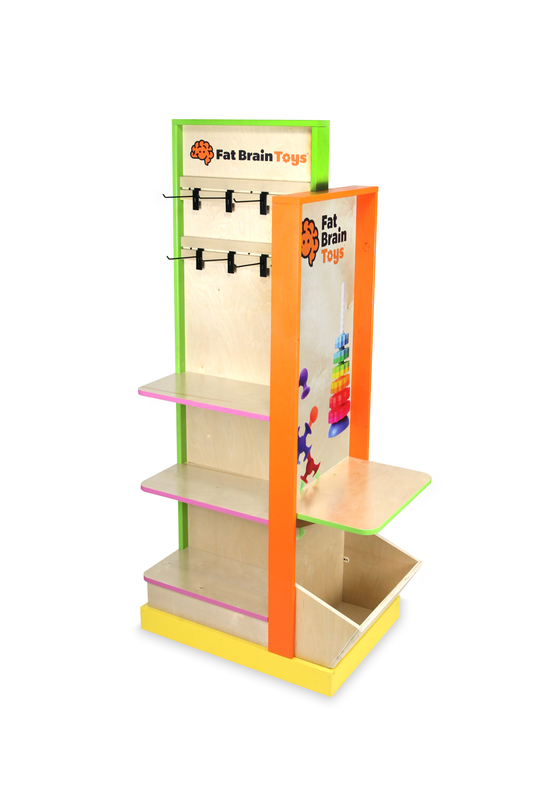 The second custom example from this year’s catalog is a 3-sided toy display we made for Fat Brain Toy Co. 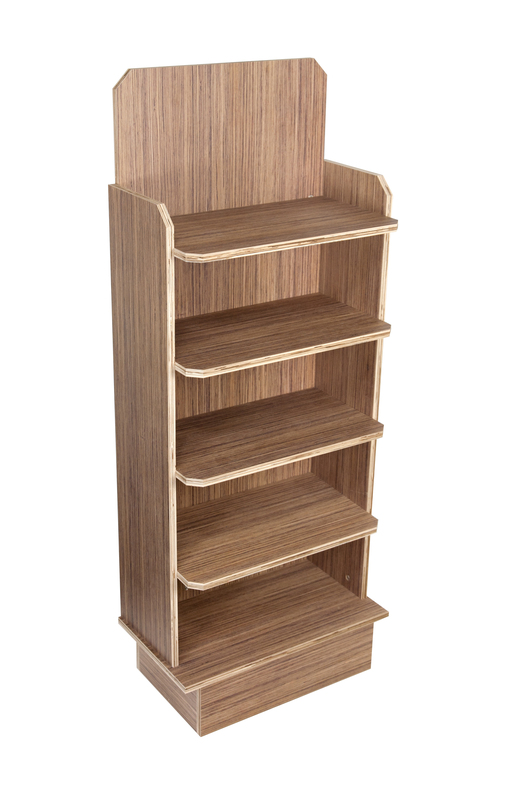 The display is constructed of solid pine wood and prefinished birch plywood. 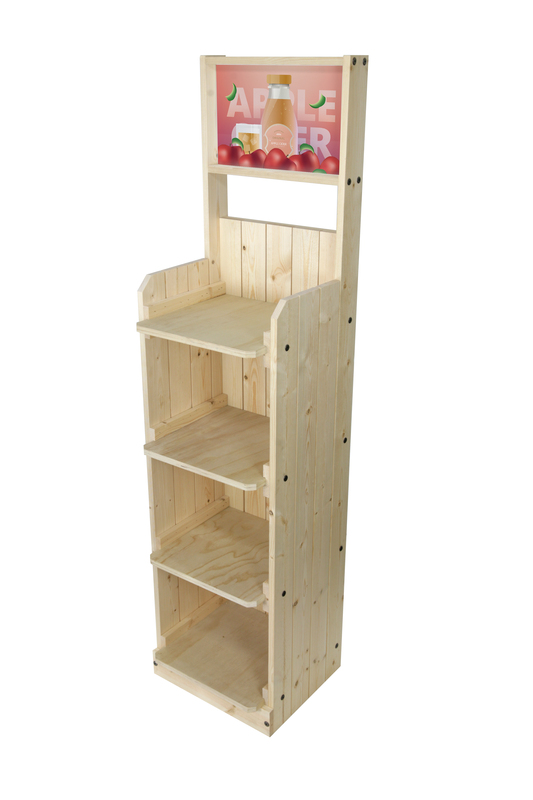 It includes colorful edge banded shelves, painted frames, a wood bin, adjustable hooks and brand-building graphics. In addition to the many custom display examples featured in our catalog, you can find a wide range of stock displays, including apparel displays, slatwall and slatgrid displays, t-shirt displays, cap displays, footwear displays, multi-product displays, sunglass displays, metal floor shelf displays, wood floor shelf displays, economy floor displays, floor spinners, counter displays, and a host of display accessories. 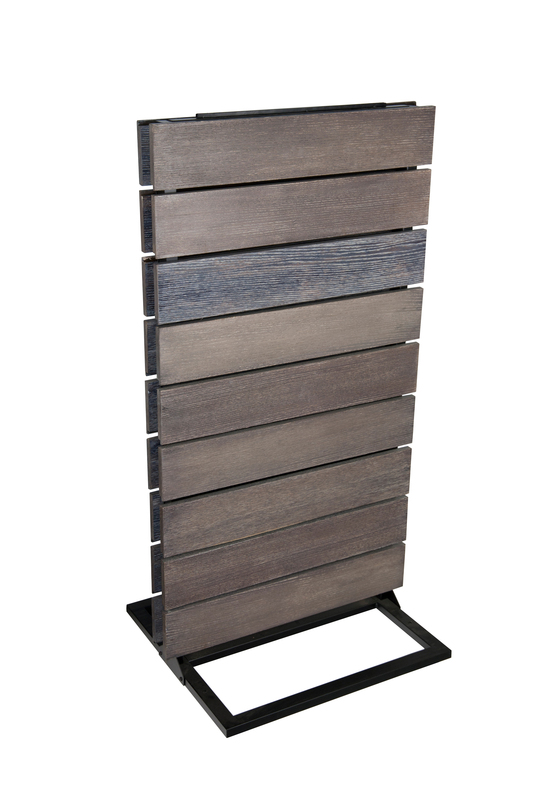 An example of one of our newer items is our SW-WD-2S which is a stained wood slat display (also available as a 1-sided display). You’ll also find a number of new wood floor displays, including displays such as our WD4SH-PLK as shown below and our WD-PRNT-1 and WD-PRNT-2 (shown below the WD4SH-PLK), both of which leverage our large format printing capabilities, enabling us to print any wood grain or other graphic directly on wood or other substrate. 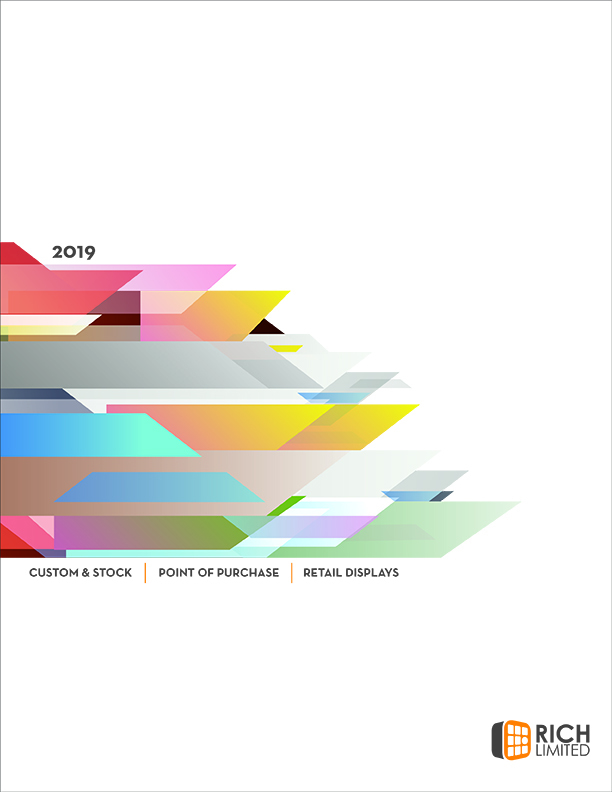 Our 2019 catalog includes lots of other new displays and merchandising solutions. We hope you take time to download the catalog and trust you will find it a valuable resource.